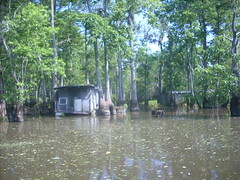 This is where the boats put in at Honey Island Swamp, Louisiana. Our friends Pat and Dale Bibee of Slidell took us out in their Sea Chaser last weekend so we could experience the splendor and biodiversity of the southern bayou. And indeed we did: we saw egrets and cardinals, wild boar and an alligator, thanks to a pesky Swamp Tour guide who was throwing marshmellows into the Pearl River and prodding the surface of the water with sticks to get animals to surface. We were the lucky ones, though: we had our own, private swamp tour with the most excellent guides! We had planned to leave Saturday night to make the trek up through Mississippi and Alabama, but just as we were plotting our next steps, the Louisiana sky turned once again to storm. A huge lightning storm right over the house, actually--we heard a bolt strike the tree next door. So we decided instead to enjoy the air-conditioning and hospitality of Casa Bibee and left early Sunday morning for a long drive through Mississippi, Alabama, Georgia and ending in southern Tennessee. There's nothing quite so spectacular for two California natives to drive through five beautiful and humid states in one day. We lucked out when we found the Hiwasse / Ocoee Scenic River State Park just outside of Delano, Tennessee, where the air was not only cooler (under 90 degrees for the first time on the trip! ), but the campsite was only about two minutes from the Hiwassee River. Perhaps the best part of the night was watching the fireflies come out--another treat for two West-Coasters. From Tennessee we drove through the stunning Great Smoky Mountains National Park to the border of North Carolina, which meant weaving our way through traffic to Dollywood (Dolly Parton's Disneyland, basically) in Pigeon Forge first. In the end it was worth it, though, to drive through 70 miles of virtually untouched green mountains, and see a portion of the Appalachian Trail. We passed signs for restaurants selling Frog Jam. Apparently there is also a chain of restaurants in this area called Fat Buddies. We made it to Durham around dinner time, where we met up with our fellow CCS grad and kickass writer Rim Vilgalys. Rim walked us to downtown Durham, where the buildings are tall and beautiful and made of brick. Today we plan to drive out to a quarry where you can swim. I keep thinking of the movie "Breaking Away." Durham has that kind of feel. From Durham we will make our way steadily northward, to Baltimore, Philadelphia, New York, and eventually Pittsburgh, before turning our wheels homeward.